The H109S X4 Pro is Hobbico's best platform for aerial photography and videography. 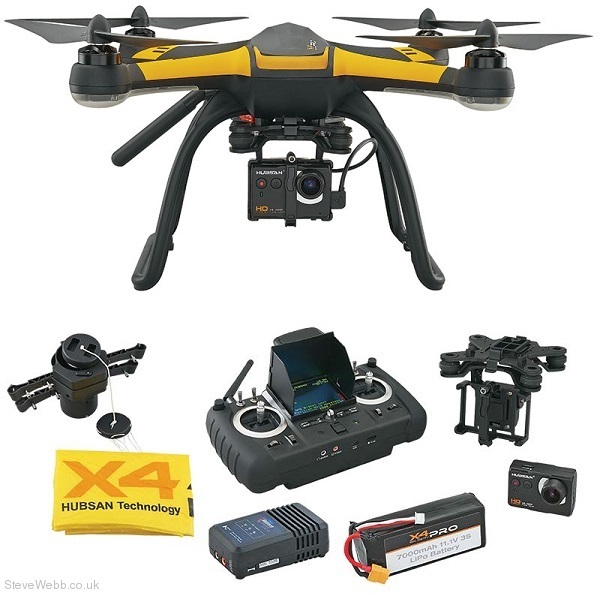 Assembled, complete and ready to fly, it includes a 1080p HD camera ideal for virtually any application and flight times that run as high as 32 minutes, depending on payload. Position Hold: Uses GPS and Compass to pinpoint X4 Pro location and flight direction. Altitude Hold: Identifies and maintains a desired altitude setting using Barometer. Holds remain in force until released. Flight battery voltage drops to dangerous levels. "Return to Home" switch on the transceiver is flipped. Onboard Navigation Features: GPS/Compass (Global Positioning); Orientation (Position Hold); Barometer (Altitude Hold) Flight Modes: GPS (Altitude/Position Hold); Altitude Hold (for indoor flight) Safety Features: Automatic Return to Home (activated by low battery voltage, signal loss or user); touch screen & OLED telemetry screen, plus onscreen low battery warning (Deluxe only). 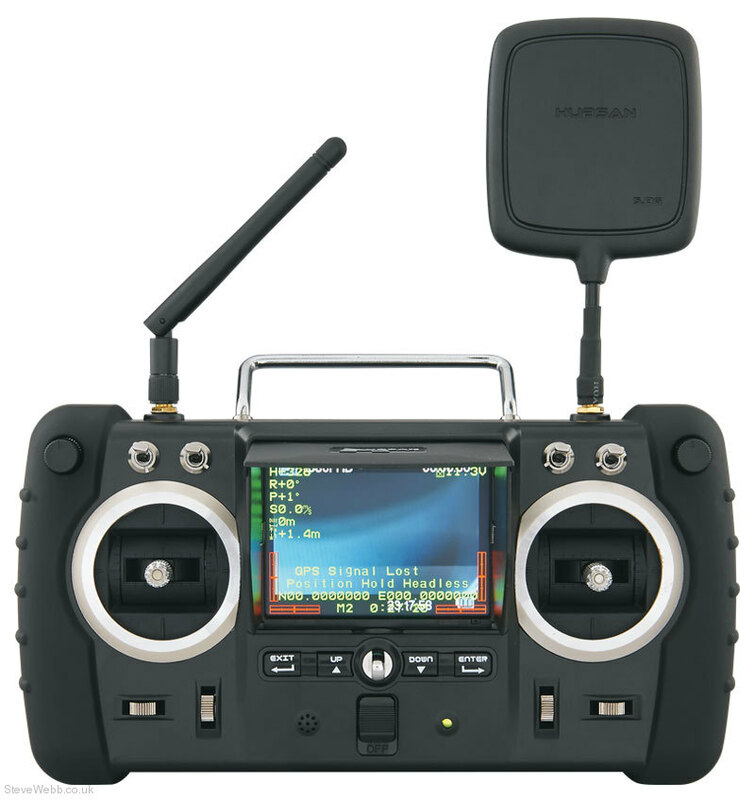 Lightweight and easy to hold, the FPV Transceiver features a bright, 3.5" LCD screen that gives you an FPV (First-Person View) of your flight as it's happening, buttons for shooting still photos and videos – and a wide range of features designed for pilot ease, quad safety and photographic excellence. Vertical Tilt: controls camera movement up/down around true 90˚ vertical. It’s a fast, automatic feature of the X4 Pro FPV, and a great option for the X4 Pro Deluxe. It deploys in just a half-second, whenever the tilt angle of the X4 Pro exceeds 80˚. A spring-loaded design ensures fast, full deployment; once deployed, it turns an emergency situation into a slow, controlled descent to the ground. The X4 Pro lands upside down by design, to protect the gimbal and camera from impact damage. Reusable, and compatible with both the X4 Pro Deluxe and X4 Pro FPV. 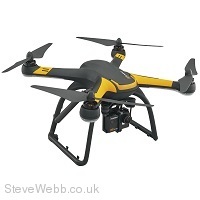 Includes: 1.25 m (49.2") parachute, 1S 3.7V 380mAh LiPo battery, charger and servo.